A portion is the amount of one food you eat at one time. Many people eat larger portions than they need, especially when eating away from home. Just one super-sized fast food meal can have more calories than you should eat in an entire day. And when people are served more food, they eat more food—even if they don’t need it. This may lead to weight gain. 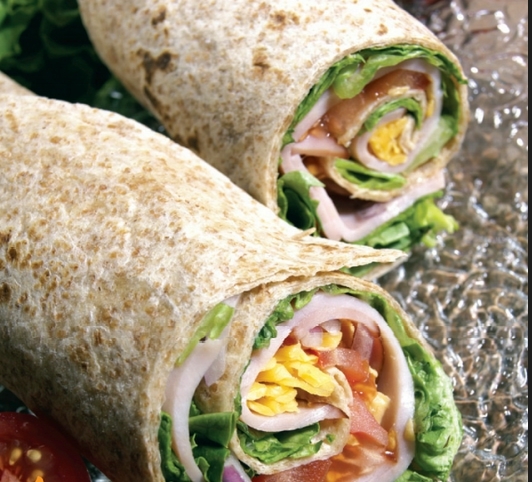 When eating fast food, choose small portions or healthy fast food like a veggie wrap or salad. Ready-to-eat meals (from a restaurant, grocery store, or school event) may have larger portions than you need. Follow the tips below to control portions. ■ Order something small. Try a half-portion or healthy appetizer, like hummus (chickpea spread) with whole-wheat pitas or grilled chicken. If you order a large meal, take half of it home or split it with someone else at the table. ■ Limit the amount of fast food you eat. When you do get fast food, say “no thanks” to super-sized or value-sized options, like those that come with fries and soda. ■ Choose salad with low-fat dressing, a sandwich with mustard instead of mayo, or other meals that have fruits, veggies, and whole grains. ■ Choose grilled options, like chicken, or remove breading from fried items. Avoid meals that use the words creamy, breaded, battered, or buttered. page 6 explains where you can find serving sizes. ■ Avoid eating in front of the TV or while you are busy with other activities. It is easy to lose track of how much you are eating if you eat while doing other things. ■ Eat slowly so your brain can get the message that your stomach is full. Your brain needs about 20 minutes before it gets the message.